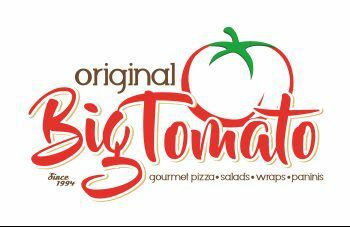 The Original Big Tomato was founded in 1994 with the goal of serving high quality and unique pizzas. From there the menu has expanded to include delicious salads, healthy wraps, oven-roasted chicken wings and our very own Panini sandwiches. But it all started with the pizzas. Our dough made fresh daily, Big Tomato's own sauce recipe, add to that fresh vegetables, delicious meats and the best quality cheeses available and you have a winning combination. If you are vegetarian, vegan or gluten-free, our menu offers many options. At the Original Big Tomato the choices belong to you.